The Khabarovsk War Crime Trials were hearings held between 25–31 December 1949, in the Soviet Union's industrial city of Khabarovsk (Хаба́ровск), the largest city within the Russian Far East (Дáльний Востóк) adjacent to Japan. There, twelve members of the Japanese Kwantung Army were tried as war criminals for manufacturing and using biological weapons during World War II. Khabarovsk is the largest city and the administrative center of Khabarovsk Krai, Russia, located 30 kilometers (19 mi) from the Chinese border, at the confluence of the Amur and Ussuri Rivers, about 800 kilometers (500 mi) north of Vladivostok. The city was the administrative center of the Far Eastern Federal District of Russia from 2002 until December 2018, when Vladivostok took over that role. It is the second largest city in the Russian Far East, after Vladivostok. As of the 2010 Census, its population was 577,441. It was previously known as Khabarovka. Khabarovsk is the closest major city to Birobidzhan, which is a town and the administrative center of the Jewish Autonomous Oblast. The Russian Far East comprises the Russian part of the Far East, the eastermost territory of Russia, between Lake Baikal in Eastern Siberia and the Pacific Ocean. Unit 731 was a covert biological and chemical warfare research and development unit of the Imperial Japanese Army that undertook lethal human experimentation during the Second Sino-Japanese War (1937–1945) of World War II. It was responsible for some of the most notorious war crimes carried out by Imperial Japan. Unit 731 was based at the Pingfang district of Harbin, the largest city in the Japanese puppet state of Manchukuo. Changde is a prefecture-level city in the northwest of Hunan province, People's Republic of China, with a population of 5,717,218 as of the 2010 census, of which 1,232,182 reside in the built-up area (metro) made of 2 urban districts of Dingcheng and Wuling. In addition to the urban districts, Changde also administers the county-level city of Jinshi and six counties. Changde is adjacent to Dongting Lake to the east, the city of Yiyang to the south, Wuling and Xuefeng Mountains to the west, and Hubei province to the north. All twelve accused war criminals were found guilty, and sentenced to terms ranging between two and twenty-five years in a labour camp. In 1956, those who were still serving their sentence were released and repatriated to Japan. In 1950, the USSR published official materials relating to the trial in English. The book was titled Materials on the Trial of Former Servicemen of the Japanese Army Charged with Manufacturing and Employing Bacteriological Weapons. It included documents from the preliminary investigation (the Indictment, some documentary evidence, and some interrogation records), testimony from both the accused and witnesses, last pleas from the accused, some expert findings, and speeches from the State Prosecutor and Defense Counsel, verbatim. 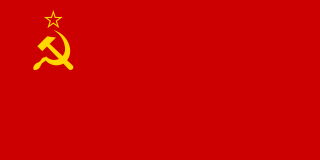 The Foreign Languages Publishing House was a state-run publisher in the Soviet Union that published Russian literature, novels, propaganda, and books about the USSR in foreign languages. These included works by Lenin and Stalin. It was headquartered in Moscow at 21 Zubovsky Boulevard. It was founded in 1946, and in 1964 it was split into separate publishers Progress and Mir. Harris also noted the controversies unleashed by the trial, which linked Emperor Hirohito to the Japanese biological warfare program, and also the allegations that the Japanese BW experiments had also been conducted on Allied POWs. ↑ Daniel Barenblatt, A Plague upon Humanity, HarperCollins, 2004, pp. 220-221. ↑ Jing-Bao Nie, "The West's Dismissal of the Khabarovsk trial as "Communist Propaganda": Ideology, evidence and international bioethics," in Journal of Bioethical Inquiry, April 2004, Volume 1, Issue 1, pp 32-42. ↑ Sheldon H. Harris, "Factories of Death: Japanese Biological Warfare, 1932–1945, and the American Cover-up (rev. ed)", Routledge, 2002, p. 318. The International Military Tribunal for the Far East (IMTFE), also known as the Tokyo Trial or the Tokyo War Crimes Tribunal, was a military trial convened on April 29, 1946, to try the leaders of the Empire of Japan for joint conspiracy to start and wage war, conventional war crimes and crimes against humanity. Otozō Yamada was a general in the Imperial Japanese Army during World War II. Men Behind the Sun is a 1988 Hong Kong historical exploitation-horror film directed by T. F. Mou. Unit 100 was an Imperial Japanese Army facility called the Kwantung Army Warhorse Disease Prevention Shop that focused on the development of biological weapons during World War II. It was operated by the Kempeitai, the Japanese military police. It was located in Mokotan, Manchukuo, a village just south of the city of Changchun. Zhongma Fortress — also Zhong Ma Prison Camp or Unit Tōgō — was a prison camp where the Japanese Kwantung Army carried out covert biological warfare research on human test subjects. Built in Beiyinhe, outside of Harbin, Manchukuo during the Second Sino-Japanese War, the camp served as a center for human subject experimentation and could hold up to 1,000 prisoners at any given time. 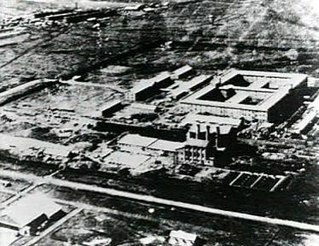 In 1937 the prison camp was destroyed and testing operations were transferred to Pingfang under Unit 731. Surgeon General Shirō Ishii was a Japanese army medical officer, microbiologist and the director of Unit 731, a biological warfare unit of the Imperial Japanese Army involved in forced and frequently lethal human experimentation during the Second Sino-Japanese War (1937–1945). War crimes in Manchukuo were committed during the rule of the Empire of Japan in northeast China, either directly, or through its puppet state of Manchukuo, from 1931 to 1945. Various war crimes have been alleged, but have received comparatively little historical attention. Kurt Blome was a high-ranking Nazi scientist before and during World War II. 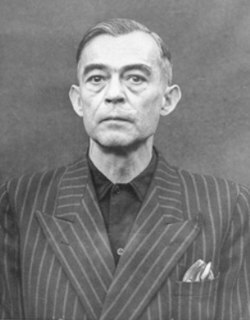 He was the Deputy Reich Health Leader (Reichsgesundheitsführer) and Plenipotentiary for Cancer Research in the Reich Research Council. In his autobiography Arzt im Kampf, he equated medical and military power in their battle for life and death. Tetsuzan Nagata was a general in the Imperial Japanese Army, famous as the victim of the Aizawa Incident of 1935. Unit 8604 was the Epidemic Prevention and Water Purification Department unit of the Japanese Southern China Area Army. It allegedly secretly researched biological warfare and other topics through human experimentation during the Second Sino-Japanese War (1937–1945) and World War II era. It was formed in Canton (Guangzhou), a city in southern China, and headquartered at Sun Yat-sen University of Medical Sciences. Prince Tsuneyoshi Takeda was the second and last heir of the Takeda-no-miya collateral branch of the Japanese Imperial Family. The Epidemic Prevention and Water Purification Department was a department of the Imperial Japanese Army from 1936 to the dissolution of the Army in 1945. While its public mission was to prevent the spread of disease and monitor water supply, several field armies also assigned units the mission of manufacturing biological weapons. Many units also performed human experimentation. Satō Shunji was a Japanese physician during the first half of the 20th century and a commander in the Imperial Japanese Army. From 1941 to 1943 he was chief of Unit 8604, a biological warfare unit that operated in Southern China. From 1944 onwards he was Chief of Medical Service of the IJA 5th Army. Defoliation bacilli bombs, made between 1932 and 1933 were used by the Imperial Japanese Army to spread bubonic plague across China. The deployment of these lethal munitions provided the Japanese with the ability to launch devastating biological attacks, infecting agriculture, reservoirs, wells and populated areas with anthrax, plague-infected fleas, typhoid, dysentery and cholera. The alumni of Unit 731, the unit that prepared these weapons, became top bioweapons researchers and were not prosecuted as war criminals. According to Richard Drayton, a Cambridge University history lecturer, researcher Shirō Ishii later moved to Maryland, where he conducted research into bioweapons. However, according to Ishii's daughter Harumi, he stayed in Japan, where he died of throat cancer at the age of 67. The Kwantung Army was an army group of the Imperial Japanese Army in the first half of the 20th century. It became the largest and most prestigious command in the IJA. Many of its personnel, such as Chiefs of staff Seishirō Itagaki and Hideki Tōjō were promoted to high positions in both the military and civil government in the Empire of Japan and it was largely responsible for the creation of the Japanese-dominated Empire of Manchuria. In August 1945, the army group, around 713,000 men at the time, was defeated by and surrendered to Soviet troops as a result of the Manchurian Strategic Offensive Operation. Various types of biological warfare (BW) have been practiced repeatedly throughout history. This has included the use of biological agents as well as the biotoxins, including venoms, derived from them. Operation Cherry Blossoms at Night was a 1945 plan developed by Shirō Ishii to wage biological warfare upon civilian population centers in Southern California in the United States during the final months of World War II, using pathogens created by members of Ishii's Unit 731. Operation PX was the codename for the Japanese plan for a biological terror attack on the U.S. west coast in World War II. The planned operation was abandoned due to the strong opposition of Chief of General Staff Yoshijirō Umezu, as well as the Japanese surrender following the atomic bombings and the Soviet declaration of war.